The AbraCabanner is an awesome looking banner that looks professional and it will make your show look even more professional. The banner dimensions are 2 feet wide by 3 feet long. It's the perfect size for the traveling magician. 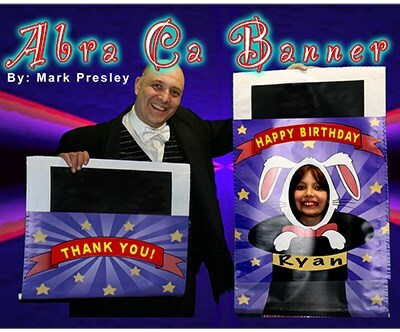 The idea of being able to customize a birthday banner by inserting the "guest of honor's" name on the banner was mainly to become a keepsake photo for the customer that hired the magician. Your customers will notice that you took the time to add a personal touch to your show. When you get the AbraCabanner wand to rabbit be prepared to make memories. When the parents see their child being turned into a rabbit you will get instant laughs. Anyone who has a camera will be snapping pictures like a bunch of paparazzi's creating that Hallmark moment that will be cherished for years to come. Not only will this make a great keepsake photo and a memorable one at that. The guests will also remember you. The day the magician turned their child into a rabbit. For those of you hard working birthday party magicians. You understand the importance of having ENERGY in your show as well as audience participation and interaction. AbraCaBanner will give you just that. "My intention was not to have the rabbit wand be just another magic novelty. I wanted it to serve as an actual utility effect"
I didn't want to just have an ordinary wand to rabbit. I wanted my wand to rabbit to be more then that. I wanted to make it an actual working effect. That's right! The AbraCaBanner comes with a BONUS "THANK YOU" banner as well. The "THANK YOU!" banner is 2 feet across by 19 inches long. You can use the "THANK YOU!" banner" as a JUMBO magic wand to make something appear or vanish. When the audience gives you a round of applause for your magical talent, you simply release the wand to reveal the "THANK YOU!" banner. Use as an actual effect? Yes! I have an actual effect that uses the two banners. Enclosed in the banner packaging is directions of an idea I came up with where you use the two banners for an effect. The GRAND FINALE of course is turning the birthday boy or girl into a rabbit. You can customize the banner by writing the guest of honors name in the banner. The banner is made of strong durable vinyl. AbraCaBanner is waterproof. You can use it outside. The banners is double layered and reinforced with a top and bottom support system. The AbraCaBanner is colorful and attractive. The banner has 5 different colors that pop out and scream FUN and MAGIC! The AbraCaBanner is great for audience participation. Comes with a BONUS "THANK YOU!" wand banner.